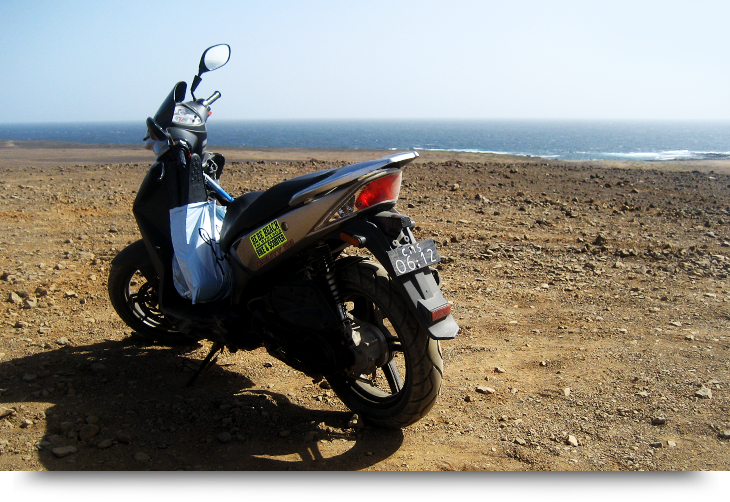 The roads in Cape Verde and Sal are often in very bad condition, lots of bumps, rocks, sand and gravel. There are only like 2 paved roads on the whole island of Sal, that’s it! I guess the rest of the Cape Verde islands is the same, if not worse. Me and my girlfriend rented one fairly cheap moped on our holiday (100 euro/3 days) and got to see the whole island of Sal together, from the north to the south. Keep in mind that a route in the Cape Verde map, might not even look like a road in real life. Be careful and don’t drive fast through sand and loose gravel, especially if you are 2 people sharing the moped like we were. It is awfully windy at times if you go over 35km/h. The west coast of Sal is the best holiday tip, several small beaches along this coast. Almost no people in sight. Check out Calheta Funda, Murderia north and south, Palmeira and also Fontana 2km south of Palmeira. I recommend going to Cape Verde Islands for your holiday if you are looking for “the real thing”. Even though Cape Verde and the island of Sal is starting to get exploited towards tourism, you can still experience the real Africa here! Sal is not the common charter destination – yet. Cape Verde might not be like anything else you have ever seen on previous charter holidays. We felt save because the locals are very friendly. It is possible to have a cheap holiday in Cape Verde islands, eating at local small restaurants and staying away from the tourist area in Santa Maria. A cheap dinner in a local restaurant is about 4-6 euro. We love Cape Verde islands and Sal and are now curious about other countries in Africa. Our trip to Cape Verde islands did cost us 1100 euro in total for 2 people, including the plane tickets, hotel with breakfast included, moped and gas, and all the food for 2 whole weeks. That is a cheap holiday in Africa, worth every penny!